The Loknath Temple of Puri has been put up to pay homage to Lord Shiva. Therefore, this temple of Puri is also referred to as the Shiva temple of the region. According to popular belief, Lord Rama established this lingam with the help of a pumpkin. This temple of Odisha is supposed to have been established in the 11th century or the 12th century AD. 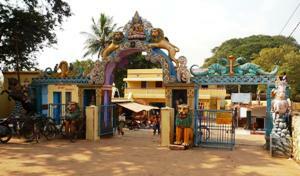 The believers of the Hindu religion often come to this temple to get a glimpse of Lord Loknath. It is widely believed that he has the power to cure the common people from all types of problems related to health. The Loknath Temple at Puri is located at a distance of about 1 km from another very well reputed temple of the town called the Jagannath Temple. There are a number of popular mythical stories that are closely associated with this temple. The most well known of all the myths and legends about the Loknath Temple in Puri is related to Lord Rama, one of the most popular epic figures linked with the religion of Hinduism.